Face it. You miss baseball. You miss the smell of fresh cut grass; the vendors yelling "Peanuts! Get ya peanuts here!" But most important, you miss the sound of a ball hit 400 feet off the sweet spot; the sound of a 94 mph fastball hitting the catchers glove, and the sight of jaw dropping defensive plays. Rest easy, my friends. With the calendar turning into the new year, that means one thing. Approximately 6 weeks before the reporting date for pitchers and catchers to Spring Training. 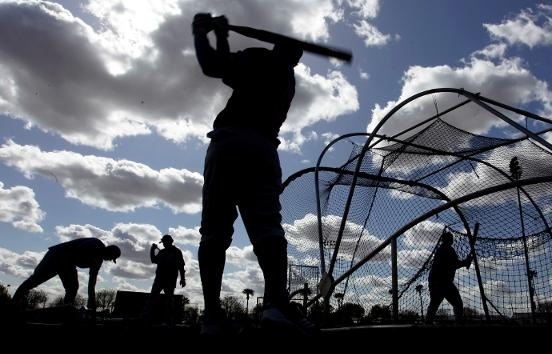 But until the players lace up their cleats in February, here are 13 things for you baseball fanatics to watch out for during the 2013 season. Well, it is news. The Astros will be the newest additions to the AL starting this season. Unfortunately for their fans, it will have no major effect on their record. Perennial bottom dwellers in the NL, the Astros will do the same in the American League as well. Still, there is a positive for the people of the city of Houston. Home games will remain cheap and fans can get exposure to some of the AL stars that they saw very little of when the Astros were in the NL. Most people will think, why do I care about this? Well, if you dig beneath the surface, Miami is an interesting case. The Marlins do have a promising core: Giancarlo Stanton, Logan Morrison, and Ricky Nolasco to name a few. Granted, that is not enough to make a lot of noise in the NL East as is, but with a handful of solid prospects and a beautiful ballpark in an even more beautiful city, the Marlins can be a team on the come up. It all will come down to if they play like a team trying to prove they belong, or if they play like a Double-A farm club. 3. Is Oakland a Serious Contender? The Athletics were one win away from shocking the world last season. Game 5 of the American League Division Series. Oakland, a team no one expected to even be there, with the chance to eliminate the mighty Tigers. Detroit prevailed, but that left everyone wondering are the A's for real? Was it just one of those seasons where everything went right for them, or are they a new team to watch out for in the American League West? Can the addition of Japanese shortstop Hiroyuki Nakajima help boost Oakland's bats to help out their top 10 pitching staff from a season ago? Their fans have a good reason to stay tuned for the 2013 season. 4. Will the Money Translate to Wins For the Dodgers? Since July 2012, all the Dodgers have done is spend. And spend. And spend. Now, it's time to see what all this spending will produce. On paper, the Dodgers have a team that should dominate the entire NL. Kemp, Eithier, Crawford, Ramirez, Gonzalez, Kershaw, Beckett, Greinke. There is no reason why this team should not get 100 wins this season. However, the game is not played on paper. They say money can't buy happiness, but this year, we will see if it can buy a championship. 5. Will the Angels Be Improved This Year? Nowadays, one cannot talk about the Dodgers without talking about their freeway rivals, the Angels. But before we start talking about an all Los Angeles World Series, the question is -- can the Angels even make the playoffs this year? Silly to even ponder that considering they landed the biggest bat on the market this year, Josh Hamilton. But, they did that last season signing Albert Pujols, and we know how that story ended. The Angles have one of the best lineups in baseball. However, the question will be can the pitching and the focus hold up to carry them into the postseason? Pitching wins championships. Can the Angels trot out the arms to shut down opponents, or will they be in slugfests night in and night out? We'll know soon enough. 6. What Will Mike Trout Do This Season? 30 home runs, 83 RBIs, 49 stolen bases, .326 average, 139 games played. Numbers that 98% of players in the majors can not put together playing 162 games, Mike Trout did. Now, it will be interesting to see if he can mirror these numbers or even surpass them. Last season, he was the young phenom putting up video game-type stats. Now, after an offseason of film study, time to dissect his game and generate more accurate hot/cold charts, can Trout continue to grow, or will pitchers have his number and force him into a sophomore slump? 7. How Will the Rangers Adapt Without Josh Hamilton? To replace 43 homers and 128 RBIs by one person is a daunting task. Especially when that void is being filled by a young unproven player. But the biggest hurdle for Texas is not replacing the production of Josh Hamilton. It's replacing the production of Hamilton and Mike Napoli. While everyone was focused on Hamilton, Napoli took his 24 home runs to Boston. If it was just Hamilton, the Rangers probably would have been alright. But to replace over 60 home runs and close to 200 RBIs from two players is a hill too steep to climb full speed. Look for the stranglehold the Rangers have had on the AL West recently to be loosened; a lot. From a perennial MVP to the reigning MVP, Miguel Cabrera looks to repeat his historic Triple Crown season in 2013. Frankly, there's no reason to think he can't. Cabrera has hit over .320 with over 30 homers and 100 RBIs for the last 4 seasons. He led the league last year in home runs in one of the biggest ballparks in the majors. With those credentials, everything says Cabrera will flirt with another Triple Crown this season, barring injury. It should be an interesting season north of the border with the Toronto Marlins. Or are they the Miami Blue Jays? Major moves this offseason for the Jays have them looking like contenders in the AL East. The acquisitions of virtually all the major players off the Miami Marlins -- Reyes, Buehrle, and Johnson, along with National League Cy Young winner R.A. Dickey and Melky Cabrera, the Blue Jays all of a sudden trot out a loaded roster. Not to mention they look to have a healthy Jose Bautista in the middle of the lineup. The Jays look to prove that hockey is not the only sport that can have a winning team in Canada. Suddenly, the AL East is not a two team show anymore. Of course, the Yankees are still the Yankees, so they are always a team to watch. But for the first time in a while, they are not the clear cut team to beat. With a healthy Evan Longoria, the Rays are a major threat to the throne. The Orioles shocked the world last season, bursting onto the scene and taking the Yankees to a game 5 in the ALCS. If the O's 2012 season was not a fluke, look for them to challenge along with the aforementioned Toronto Blue Jays. The American League East may just be the deepest division in the baseball this year. With the start of every season comes a handful of teams that need to perform. With that need comes a manager who might just receive a pink slip if his team does not perform as expected. The once model for how to make more from less, the Minnesota Twins, have fallen on hard times. Ron Gardenhire finds himself in a position where he needs to right the ship and get his team back on the winning path. Along with him is Mike Scioscia. With all that money invested in this Angels' roster and a disappointing playoff absence last year, this may be an all or nothing season for him. Charlie Manuel should not rest easy, either. The one time gem of the NL East is looking more like another average NL team, and the skipper may have to pay. If the Phillies do not make the playoffs this year with three former Cy Young winners in their rotation, look for Manuel to be out of a job. A name that has been tossed around quite a bit this offseason is Arizona outfielder Justin Upton. Only 25, Upton combines speed, power, and a solid glove. He could not only be the missing piece to a team's postseason push, but the potential face of a franchise. Along with Upton, Arizona's Jason Kubel may go as well. Both are solid bats so a team in need of an outfielder or a bat may look to land one of the two before the deadline, if they don't move before then. With the arrival of Jurickson Profar, Elvis Andrus has found himself expendable in Texas. Look for the Rangers to shop his name actively in an attempt to gain a bat to replace Hamilton or Napoli. Every year a team comes out the blue and turns heads. Look for the San Diego Padres to quietly be surprisingly good this season. A solid lineup led by Chase Headley and Carlos Quentin, supporting a pitching staff led by Edinson Volquez along with Huston Street closing games, the Padres can feed off of their lack of coverage and sneak into a wild card spot. A team that may be surprisingly bad? The Toronto Blue Jays. How can a team that loaded be bad? Simple. A core part of the team came over from the Marlins. They are not still in Miami because they folded under the pressure of expectations. R.A. Dickey won the Cy Young but he is coming off a team that had no expectations. The rest of the club has never been in a situation where they were expected to do anything but act as doormats at the bottom of the division. Do not be surprised if the Blue Jays leave their fans feeling blue midway through the summer. Baseball is almost back. But until the sounds of the first balls start popping mitts in Spring Training, sit back and let your baseball minds feast on this food for thought heading into the 2013 campaign. Nice post! Can't wait for the season to start! Looking forward to seeing what my A's do this season. I think they're legit.